As a blogger you need some image capturing and processing tool to quickly create images for your website. Especially, high quality images helps a lot when you are running a tutorial or how-to site. There are many free and premium software available in market to make the bloggers life easy. And Snagit is one of the easiest and cost effective image processing and screen recording tool from TechSmith Corporation helps to improve the productivity of bloggers significantly. In this article we explain the features and capability of Snagit which you can refer before buying. What Can You Do With Snagit? You can capture the screen images and videos, edit with useful features and share on social networking sites or save locally to use it anywhere. Capture the region, window, active window, menu, object and use scrolling option to capture the full page. Capture text from the screen, menu items with time delay and include or exclude cursor on image. Select multiple areas on the screen and capture full length webpage with URL. Record webcam and screen activities as a video. Once the mode of capture is selected as image, you can click on the capture button to get the input as defined. The output of the image can be opened on the editor or kept on the clipboard for further editing. You can set the delay for capture with counter showing the timer so that the menu items or any preparatory steps can be done before capture. 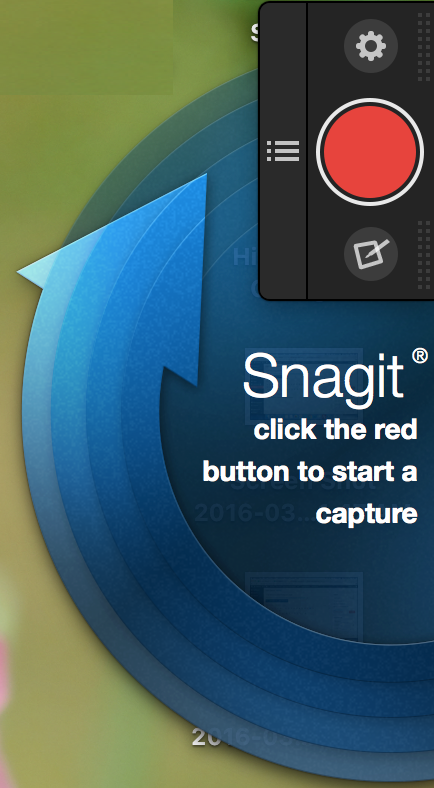 Once the image is captured by default it will be opened on Snagit editor, you can change this in settings to save in clipboard as well. There are numerous options for editing your image on Snagit. On Mac version, all the available options are classified under “Tools” and “Effects” sections. Insert a callout with simple text and different callout styles. Draw predefined shapes like circle, rectangle, etc. Trim, cutout, blur and fill with any colors. Draw free hand lines, arrows and highlight the important content on the image. Add steps with automatic sequential numbering. Add large varieties of stamps. You can save the image to one of the available formats – Snagit project file, PNG, JPG, BMP, TIFF and GIF. Also you can directly share your images on social networks like Facebook and cloud storage like Dropbox. 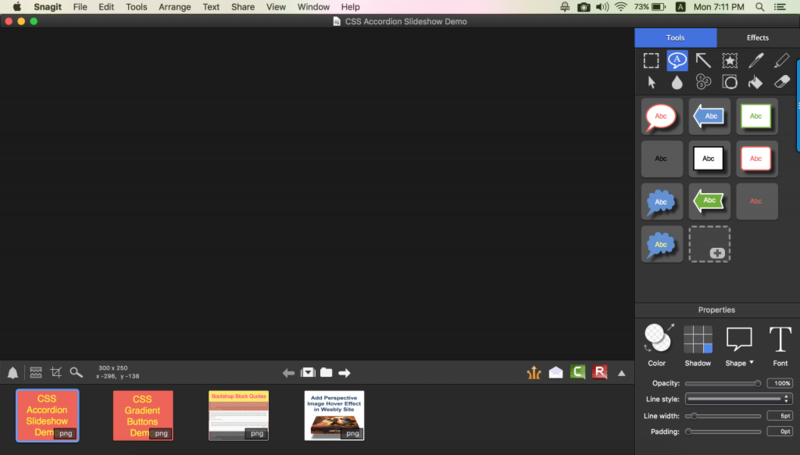 Snagit is available for both Windows and Mac and is offered in three versions. Personal and Professional version which costs you around $49.95 for single license. This is a complete version for home and office work. Educational version which costs you around $29.95 for single license. Government version which costs you around $42.95 for single license. Snagit single licensed version can be installed on two computers and educational / government versions need verification of qualification by TechSmith Corporation. Since the product is being offered for both Windows and Mac, we have noticed there are differences in functionalities between those versions. Basically Windows version has lot many features while Mac has unique set of features. If you are using both Windows based PC and a Mac then it is a good idea to download the free trial on both platforms and check the suitable product for your need. The free trial ends after 15 days and you can activate the free version with a product key after purchase. The one-click editor is a floating stick shortcut offering quick tools to capture images and videos. Ensure to enable this feature to improve your productivity. Stamps are the stock images which can be added on your image to create the needed effects. For example, you can place a map pin or insert a question mark on your image. Since the stamps are high quality images you can also use it with transparent background as an individual image. Download the stamps directly from the Snagit editor or from TechSmith website to include custom stamps on your images. You can upload all you images directly from Snagit to your webiste’s server using FTP sharing option. Especially when you are using content management system like WordPress, it will be easy to upload images and retrieve the images directly from the admin dashboard front end. TechSmith also offers a mobile app called Fuse which helps to easily transmit media files from your phone to Snagit over Wi-Fi. You can also connect your mobile device to Snagit and record the mobile screen activities seamlessly. Snagit is one of the professional solution for creating high quality images for your website and other purposes. It has many useful features to simplify the editing and improve your productivity. It can also be combinely used with other products like Fuse, Screencast and Camtasia. We strongly recommend to give it a try to have wonderful images on your site.